Rifles & Spears was originally aimed at portraying actions set in 19th century ‘Darkest Africa’, though always with an eye on ‘other stuff’. However, it doesn’t (and hasn’t) been limited to Africa as really the rules cover any colonial theatre of the mid to late 19th century. Whilst not appearing on this blog before the Indian Mutiny has been a period of interest for sometime. In fact, in this post, I’m stopping by in India on the way to looking at using Rifles & Spears for the New Zealand (Maori) Wars. However, before I venture to the antipodes, I thought it might be a good idea to pop up some information on using Rifles & Spears (or Muskets & Tomahawks for that matter) for the Indian Mutiny, as there are a number of people in our club that have armies and have requested some suggestions on the period… not to mention I have a rather large collection myself….oh, I wish Iron Duke Miniatures was around 5 years ago! So, to that end this small post detais some thoughts and information on using Rifles & Spears for the Mutiny. Included are some thoughts that equally apply to Darkest Africa or any other theatre suited to the rules theme and scope, particularly those aspects relating to cavalry and artillery This may prove useful to others who want give it go working with the Studio Tomahawks’ rules Muskets & Tomahawks. As the Mutiny is in the mid 19th century Muskets & Tomahawks can quite easily be used for that period without having to delve into the later issues of breech-loading rifles and machine guns. Therefore, anyone with a copy of Muskets & Tomahawks will be able to use any/all of these rules suggestions as they like…on to Delhi! If ever a period of military history revolved around the acts of individuals, the Indian Mutiny is it. The heroic efforts of individuals, formed such a tapestry of tales with stories of bravery and heroics that truly defined a Victorian Hero – the boy’s own adventure stories never had a grander stage than the Indian Mutiny. Put together with battles a plenty along with acts of cinematic tales worthy of the best yarns one could tell, it all goes to provide an endless back drop to Queen Victoria’s most devastating war of the nineteenth century. The uprising, predominantly in the Bengal Presidency, came from the culmination of a steady rise of discontent with British rule, resulting in the fabled ‘soiled’ cartridge affair which sparked the tinderbox, which was the Sepoy Rebellion. In this, the mutinous elements in India rose up against their former Sahibs. So sudden and unexpected was the uprising, characterized by terrible atrocities military and civilian alike, which gave the war a particularly nasty ‘edge’, the British Empire strained to save its jewel in the crown – it was unlike any other colonial conflict yet experienced by Great Britain, involving more troops than she sent to the Crimea. In the Mutiny, troops came from all corners of Victoria’s realm to re-establish order, providing a military menagerie untypical of Her Majesty’s ordered legions. To the miniatures gamer, the period has much to offer. There were alot of localised actions with the British forming ‘Movable Columns’ that generally limited the overall size of forces engaged, resulting in many small to medium sized actions, with very specific objectives. The Mutineers also mustered their troops in a similar way, usually under the leadership of a charismatic personality. Numerous sieges and ‘last stands’ of desperate outposts combine to offer all manner of skirmish scale actions perfectly pitched at the scale of Rifles & Spears. Battles were fought using handfuls of British battalions against masses of mutineers – stirring stuff! These forces were lead by very colourful characters on both sides and the uniforms look great. It’s possible to field a force where every unit looks different, but need not be so if a player prefers a more homogeneous look to his army. Where else can you have on the same field of battle Bengal Lancers, Sepoys, Sikhs and Elephants, along with Her Majesty’s soldiers, sailors and marines, including such venerable units as Rifle Regiments, Ghurkhas and Highlanders all mixed in with civilian volunteers – the mutiny offers variety with which few periods can compete. Along with this cast of characters the war was fought in that most exotic of places – India. Battles raged through cities, villages, deserts and jungles; along the banks of the Ganges and at the foot of the Himalayas, the war provides a backdrop that simply shines. Also, in recent times, the information that was once hard to get is now plentiful. There are many vivid accounts of the war and more popular histories that provide all the information needed to fully appreciate the scope and struggle that the Mutiny entailed. Whilst not initially well catered for, the prolific range of Iron Duke Miniatures along with the established range from Mutineer Miniatures really provides all that an Indian Mutiny gamer could ask for. What follows are some ideas and thoughts on organising and portraying armies using Rifles & Spears or its ‘mother’ rule set Muskets & Tomahawks. I hope it is of some interest. Rifles and Spears is a massed skirmish game and it is worthwhile keeping that in mind when depicting forces in the Mutiny. The game system easily handles 50-70 figures a side and thus can be seen to portray company level actions. The nominal scale is 1 figure equals 1 man though it would not be unreasonable to increase this ratio slightly if wishing to represent forces in the order of a 2-300 man engagement. This would provide a good spread of troops if wishing to field different types, though in the Mutiny, ad hoc organisations were possible even at the very low level…so it all works out rather well. Rifles & Spears is however, not a battle system. So whilst your troops might line up and look like they are in battlelines, every unit is capable of being deployed in ‘skirmish’ mode. In fact , this is the default condition for all units except those that can adopt a ‘formation’. This is represented in the rules by the Drilled trait which enables ‘firing line’ formation with its attendant pluses and minuses. This formation is depicted in the standard Muskets & Tomahawks game by having all Drilled troops, mostly trained Regulars, as having a reduced fire number (5+ vs 4+) thus encouraging them to adopt a formation that delivers them optimal firepower ie firing line, which gives a +1drm when shooting. This same design mechanic works equally well for the Indian Mutiny. The British Army was in a period of transition, ostensibly from the late 1830s to the early 1860s, by having all troops being able to adopt open/extended order light infantry roles, as well as still form up in close order to deliver volleys much as they had in Wellington’s time. This resulted in the traditional flank and centre company distinctions becoming obsolescent. The soldiers in the Mutiny were very much at the forefront of this process. Therefore, in Rifles & Spears you can use the concept of ‘aimed fire’ if drilled regulars. This allows troops to adopt either a volley fire style of shooting or a more individual ‘in your own time’ aimed fire role. We limit this ability to the Regular troop type only, reflecting the training involved to achieve this level of proficiency worthy of the additional +1drm fire modifier. Other non regular types may be given this ability on a case by case basis. The introduction of the rifled musket greatly enhanced the utility of the later as the weapon itself leant itself to the concept of ‘aiming’ which is much more problematic using a smoothbore musket…if realistically possible at all, except at the shortest of ranges. Thus the Mutiny as a gaming subject provides us with an interesting tactical evolution as far as the British forces are concerned. We have troops trained to both operate in drilled close order with both smoothbore and rifled muskets as well as the general adoption of extended order fighting as well. This gives us interesting tactical decisions to choose from and combinations to play with. What the Mutineers lacking in tactical-technical innovation they more than make up for in shear variety in the forces and styles of fighting their forces can incorporate. The mutinous Sepoy units, essentially behave in the manner of Wellingtonian redcoat infantry. They can form up and function as they had under their British sahibs but do not derive an aimed fire ability ie they are best deployed in firing line formation to increase their fire ability (from 5+ to hit to 4+). However, generally speaking we shall reflect that the Sepoys are not as proficient in small unit fire discipline as their British counterparts so we classify them as ‘Poorly Drilled’.This classification gives them all the usual benefits of a firing line formation but the reduced effectiveness in delivering crisp, sharp, controlled volleys like British infantry which is reflected by not prevising them with the -1drm to any target reaction test received from volley fire. The heavy losses modifier still applies should they be fortunate enough to deliver such execution on their target. Still allowing sepoys the drilled ability in the rules seems more than appropriate. Whilst the increase from 5+ to 4+ when shooting doesn’t seem significant the main benefit is that when negative modifiers apply the infantry do not rapidly reduce fire effectiveness by going from 5+ to 6+…so form up your sepoys to get the maximum fire potential from them! When coupled to the presence of an officer, nearby regimental colors and the usual bonus for unit size and formation, they can become quite resilient. If you disperse them and use them in an ad hoc light infantry role they will be less effective in both shooting and their willingness to pass reaction tests. Typical sepoy units had a specialist light infantry company and these troops are best placed to function as traditional light infantry unless other non regular types are used in this role. Other non sepoy units are aplenty in a mutineer army. Ranging from excellent cavalry support, both light cavalry and the more ‘battle cavalry’ Bengal types, generally good artillery support and and kaleidoscope of irregular ‘wallah types’ being anything from armed civilians, Badmasher bandits or the more deadly Ghazi fanatics. All these types combine to provide a potent force mix in the hands of a wily Mutineer commander. All these troops have unique elements that the unit entries show, however, it is worth touching on a couple of other ‘arms’ to highlight their effect in the Mutiny, as their role is likely to be more prevalent and we haven’t discussed such issues for Rifles & Spears just as yet…cavalry and artillery. Cavalry in Muskets & Tomahawks naturally enough plays second fiddle to the multitude of infantry types in North America, which the rules are principally aimed to depict. For the Mutiny, horse and guns are common, as they are in certain theatres in Africa such as Egypt and the Sudan and Southern African temperate climates clear of the dreaded tsetse fly, ever the enemy of mounted forces. Cavalry follows all the normal rules in Muskets & Tomahawks but we include some additional rules which, in our opinion, better reflect some unique elements of mounted forces. Even with our additions, there may be exceptions so these extras can be seen as ‘standard’ or ‘general’ cavalry additions where in fact some may not apply to certain cavalry types. To be fair, Muskets & Tomahawks was never meant to really handle cavalry heavy games and the treatment they have in the rules is entirely appropriate. Following on from those caveats we can take these rules essentially in the sequence of a charge. When cavalry charge they move into contact with a target just as normal. However the ‘terror’ of a mounted attack we shall take to be the same as that of a bayonet attack by troops in firing line as currently depicted in the game i.e. troops receiving a cavalry charge must test their reaction in phase 2 of the charge sequence. If the target unit is a long firearm equipped infantry unit in firing line, attacked frontally, that pass their phase 2 reaction test, they then add +1 to their defence rolls in the first round of melee. This essentially reflects drilled troops deployed in a firing line using bayonet armed muskets and rifles. Infantry or artillerymen with small weapons such as carbines do not get this bonus. If cavalry successfully win a melee then they get a bonus in the post combat ‘hack’, as this is where cavalry are at their most deadly. We give them a +1, however a +2 doesn’t necessarily seem unreasonable either…perhaps this could be reserved for certain cavalry types…it’s +1 for all just at the moment. Finally, we include an optional, but we think, useful rule once the melee is over. After combat is resolved the involved cavalry unit(s) are given a ‘blown’ marker. This will limit the next activation to recovery. This is essentially the same as the current ‘shaken’ rule which requires that a unit so marked uses its next activation to remove the marker before doing anything else…as the horses catch their breath and the riders their composure…both getting themselves sorted. These rules taken as a whole emphasise the power of cavalry in the attack, the terror they can instill in the enemy, the effectiveness of their pursuit but vulnerability vs steady infantry and relative vulnerability in a post melee situation. Artillery in Rifles & Spears is more comprehensive than those types presented in Muskets & Tomahawks. Artillery in Muskets & Tomahawks plays a minor part in most games, much like cavalry, but is more prevalent in 19th century armies so needs a closer look. When surveying armies of the 19th century, particularly in India and Africa, we see the full spread of ‘technologies’. Not only do we need to take account of the 18th century style smoothbore artillery but also the introduction of ‘modern’ smoothbore artillery types of the Napoleonic era subsequent to the introduction of rifled artillery in armies by the mid to late Victorian era. For our purposes using the sub-divisions of ‘light’ and ‘heavy’ will be in keeping with the existing Muskets & Tomahawks system plus the addition of siege artillery used in a field-gun role. By using these broad categories we can delineate modern from antiquated or excessively large weapons and their use in the game, whether they be rifled or smoothbore. If we look at the heavy and/or antiquated guns first. Siege artillery will generally encompass weapons larger than 12pdrs (and the rifled artillery equivalent) which saw service at various times in a ‘field gun’ role, most notably in the Mutiny, though certainly in other theatres as well. The first way we account for these behemoths of the battlefield is by the number of activations the weapons can undertake and also the sequencing of how the weapons are used. For antiquated weapons of the pre Napoleonic era and siege pieces such as naval guns of 18, 24 and 32 pound categories, which often found their way into the field such as the navy crews of the Royal Navy, we use the existing mechanic of two 1-action artillery cards placed in the deck which limits their firing in a turn to one shot ie one action to fire and another to reload. It also limits any move potential to two actions per turn, reflecting their cumbersome nature. For very large ‘siege’ pieces these weapons gain an additional +1drm when conducting fire against buildings accounting for the destructiveness capability of these ‘heavy hitters’ along with the usual increased lethality of heavy artillery over smaller pieces. Modern artillery encompass all the Gribeauval style cannons and their successor weapons of the 19th century, typically 7pdr to 12pdr in size. These weapons activate on their ‘troop type’ card, so a Regular artillery battery will have two 2-action cards per turn…doubling the number of activations over siege or antiquated weapons, enhancing their effectiveness. When given a limber these weapons become much more mobile and capable on the tabletop. Another intended effect of activation by troop type is the ability to coordinate field artillery with other troops of the same class, something not as easy to do with a separate artillery activation card, thus an entirely regular force gains a good deal of coordination between the various arms within a player’s force. All rifled field artillery is considered modern and hence more accurate and with greater destructive power reflecting the general advancement of targeting and ammunition capability when fired at anything but point blank range, where the smoothbore weapon retains their lethality of 3+ to kill whilst rifled weapons have a slighty reduced 4+ to kill..acknowledging that smoothbore weapons are generally more lethal when firing canister than their rifled equivalents. Whilst not entirely a precise model overall, this approach broadly rings true and works well enough within the constraints of the card activation system for a mass-skirmish game, which I think actually does a nice job of bringing these factors into play through elegant interaction of the game systems. As with all things, exceptions can apply where a particular weapon could be classed as a hybrid or different class eg the British muzzle-loading 7pdr in use during the Zulu War would be a good candidate to count as a smoothbore for fire purposes even though it was a rifled weapon. By applying the full suite of ways the game portrays troop types it can be seen that a Royal Navy gun battery of 18pdrs during the Indian Mutiny, who would be considered elite, get three three activations during play ie the two 1-action Artillery cards and a further action on the Forward Boys! Card for being elite. The guns themselves would need a bullock train to move the weapon and the 18pdr would be considered a heavy artillery piece with enhanced destructive power vs built up structures. So there you have it, a brief overview of how some in game effects apply for representing troops for the Indian Mutiny using Rifles & Spears. The force lists below can be equally used for players with the Muskets & Tomahawks rule system…they work just as well. You can download the Rifles & Spears unit data information here. These can easily be used with Muskets & Tomahawks as well with little adaptation. The following information is a truncated version relating to some background and general unit information presented as a quick overview. You can find the original page here for details including uniform information. It is included here as a quick primer describing units, battles, relative locations, etc – the original webpage has uniform details not relevant to our discussion so is omitted… John French wrote the excellent Wargames Foundry Book “The British In India”, which is an invaluable resource for all Indian Mutiny gamers. For players wanting another online resource of the conflict with a bit more detail there is some excellent info on this webpage and part two here that covers the period very well. The Indian Mutiny gamer is well serviced with the Mutineer Miniatures line of figures from which most of my collection was built, however it is likely that it will now be eclipsed in scope by the excellent and ever expanding line of Figures by Iron Duke Miniatures which are retailed by Empress Miniatures online store. 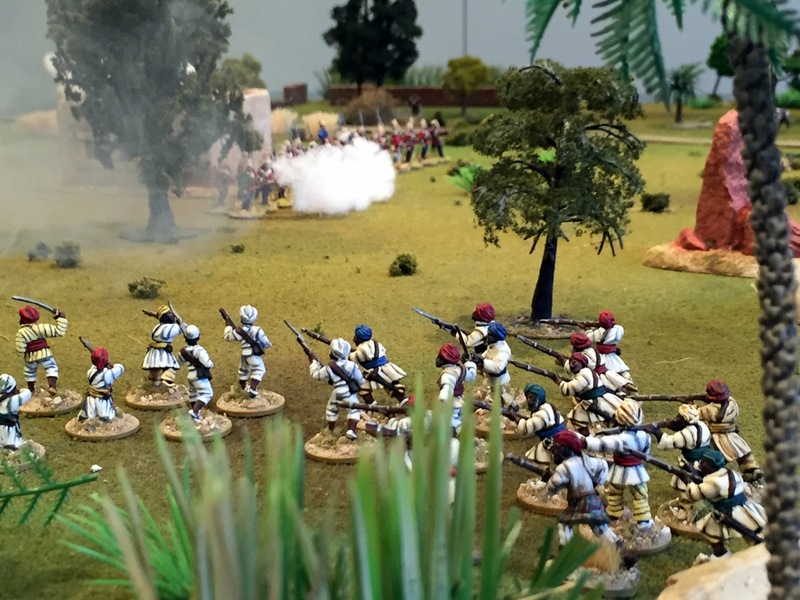 Iron Duke a Miniatures, owned and supported by Mike Snook, has somewhat transformed the Indian Mutiny in recent times. On his web blog there is wonderful background information, which combined with the brief details described in this post and weblinks, gives you most of what you need to know to get going before spending a cent on the many excellent books on the topic. The Mutiny is now very well serviced with top quality miniatures from both these manufacturers and excellent historical background information… quite a boom time for Mutiny gamers. Much has already been written about the causes and the course of the Indian Mutiny. The idea here is to help the wargamer set up an army in one of the most colourful campaigns of the Victorian era. Various troop types were involved on both sides. There were men from the regular British army as well as units of the Honourable East India Company (HEIC). Added to this were regiments of Sikhs, Gurkhas and Beloochis. Irregular units, including Punjabis, also fought alongside the British, the Royal Navy provided detachments, and cavalry could comprise both regular regiments as well as ad hoc units. Artillery ranged from HEIC Horse Artillery (from Bengal & Bombay Presidencies), to elephant-drawn siege guns. Transport included camels and elephants, a wide variety of carts, and palanquins or dhoolies (portable screened beds). There were lumbering armies with masses of camp followers and highly mobile forces of cavalry and horse artillery. On the mutineers side were units of Bengal Native infantry and cavalry, many of whom retained vestiges of uniform and equipment. Also present could be badmashes (“riff-raff”) and civilians who attached themselves to the mutineers and who could arrive and disappear with equal rapidity. Frequently present were religious fanatics, Ghazis, who cared nothing for their own safety. Afghanis and various groups of tribesmen fought for loot, and several princes provided troops. They looked upon this as an opportunity to regain lost prestige. Camel gunners and large numbers of wall-mounted guns on city walls, as at Delhi, also add interest. Battles ranged from skirmishes to those involving many tens of thousands of combatants. There were sieges, storming parties and street clearances with house-to-house fighting (again as at Delhi). Terrain can include built-up areas, large plains, farmland and swamps. Some of the actions fought are listed below, although this is by no means exhaustive. Skirmishes against guerilla bands took place until December 1858, and Tantia Topi was not captured until April of 1859. Numbers involved in the fighting are approximate. The figures in brackets in the “place” column refers to the state where the action occurred. These are detailed at the foot of the list. *Sometimes written “Futtehpore.” Many place names have several spellings. (1) Uttar Pradesh, India. (2) 10 miles from Lucknow (modern Pakistan). (3) Bihar, India. (4) Haryana, India. (5) Madhya Pradesh, India. (6) Rajasthan, India. The following lists show what happened to individual Bengal Native Army Regiments during the Indian Mutiny. (m) = Units that mutinied . (d) = Units that were disbanded or disarmed. “Place name” is where this occurred. Lists are compiled from information in several secondary sources listed in the bibliography. The 5th Regiment had black facings, the remainder orange. For other uniform information see below. Some irregular cavalry units survived, even when portions of some of them mutinied. The names were changed at various times but by 1914 they had following titles :1st became 1st Duke of York’s Own Lancers (Skinner’s Horse); 2nd became 2nd Lancers (Gardner’s Horse); 4th became 3rd Skinner’s Horse; 6th became 4th Cavalry; 7th became 5th Cavalry; 8th became 6th King Edward’s Own; 17th became 7th Hariana Lancers; 18th became 8th Cavalry. Regiments of Bengal Native Infantry. As with the cavalry, some units only partially mutinied, or were disarmed, and later reconstituted. Some men were formed into irregular Punjabi infantry units, others became part of regular Indian Army regiments. 70th disarmed, became 11th Rajputs. In June 1858 the loyal sepoys from the 21st and 27th Regiments were formed into the 30th and 31st Bombay N.I. At the same time a new Punjabi regiment was formed from the loyal sepoys of the 3rd, 36th and 61st Bengal N.I. This area was mainly Oudh Province which included Delhi, the ancient Moghul capital, and Lucknow. QUEEN’S REGIMENTS – BRITISH REGULAR ARMY. 53rd R of F (Shropshire) Lr, Lc also at Cawnpore Dec.1857. The Rifle Brigade Lc also at Cawnpore. Royal Artillery reinforcements came from Britain with Campbell in August 1857 and were then present at several actions. As with above, the Royal Horse Artillery were sent from Britain as part of Campbell’s reinforcements. They had not served in India for many years. 1) Delhi siege train included 14 heavy guns (8 x 18-pdrs., 6 x 24-pdrs.) 14 mortars, and 6 howitzers. 2)Bombay Artillery used 9pdrs. Large guns can be used for garrisons, but look impressive when drawn by elephants. Royal Engineers – Engineers again were present at many actions particularly such as Delhi. They not only helped to plan defences and sieges etc., but were responsible for leading storming parties. 1st Bengal (European) Regt. (Fusiliers) D, Lc also engaged at Fategarh and Cawnpore. 1st Madras (European – ‘Neill’s Blue Caps’) Regt. (Fusiliers) Ld, Lc, also fought at Allahabad and Cawnpore. 1st Regt. of Cav., Punjab Irregular Force D, Lr, also at Agra. Guides and Dograhs – Served in area around Delhi and were part of 4th Column of assault. Both infantry (6 companies) and cavalry (3 troops) in march to Delhi. The Sirmoor Battalion (Gurkhas) D. This unit held Hindoo Rao Ridge for more than 3 months, beat off 26 attacks, and took 335 casualties. Cavalry (Gentlemen Volunteers) / Civilians. QUEEN’S REGIMENTS – REGULAR BRITISH ARMY. 14th (The Kings) Regt. of (Light) Dragoons CI. Regt. had been serving in Persia. 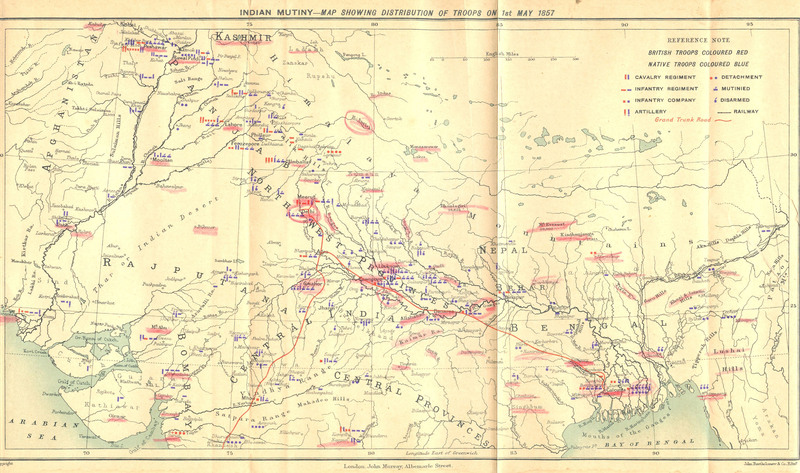 Central India operations from June 1857 to late summer 1858. 17th Regt. of (Light) Dragoons (Lancers) CI. The Regt. was part of the hunt for Tantia Topi in the autumn of 1858. 71st (Highland ) R of F. (Light Infantry) CI. Had been in Malta and sent to India early 1858. 86th (Royal County Down) R of F. CI. Actions include minor part in storming of Jhansi & Gwalior. 88th R of F (Connaught Rangers) CI. In April 1858, two companies of this regiment were used to form part of the Camel Corps, along with men from the Rifle Brigade. Naval Brigade. See notes in Northern Provinces above. In the absence of more details regarding these last four units it is probable that the would be similar to Punjab Irregular units as in Northern Provinces above. Units involved in smaller actions or as holding troops or where only part of regiment was involved. They were not awarded battle honours for their part in the campaign. The 3rd (The King’s Own) Light Dragoons, later,1861, The 3rd (The King’s Own) Hussars. 7th (Royal Fusiliers) R of F.
13th (1st Somersetshire) (Prince Albert’s Light Inf.) Regt. Arrived 1858 ex-Cape as part of Azimgarh Field Force. 19th (1st Yorkshire,North Riding,Princess of Wales’s Own) R of F. Served 1858. 24th (2nd Warwickshire) R of F. Actions include Jhelum, where 300 of 1st Bn. drove off 1,000 enemy. 29th (Worcestershire) R of F.
35th (Royal Sussex) R of F.
59th (2nd Nottinghamshire) R of F.
87th (The Royal Irish Fusiliers) R of F.
Present Peshawar, near Afghan border. 91st (Princess Louise’s Argyllshire Highlanders) R of F.
Robart’s Horse (later 17th Bengal Cavalry). Jat Horse (later 14th Bengal Cavalry). 4th Sikh Irreg. Cav. (later 13th Bengal Cavalry). For various other irregular cavalry units raised in Bombay and Central India, they could be treated as 4th Sikh Irreg. Cav. above. Rohilkund Horse (later 16th Bengal Cavalry). Described in Major D. Jackson’s book (see below) as spending 2 years putting down Sepoy Rebellion. NOTES ON SOME BATTTLES AND SKIRMISHES. Made by 5 columns. Composition of columns plus approximate numbers of men involved. 1st Column & 2nd Column – To storm breach near Kashmir Bastion. To storm breach at Water Bastion. 3rd Column & 4th Column. To assault Kashmir Gate. To attack suburb of Kissemgunge & Lahore Gate. Jhind Auxiliaries, 300 (to cover advance of storming parties before joining reserve). Accounts of the storming itself are available in most general histories. Jhansi 21st March – 5th April, & Betwa 1st April 1858. Lt.General Sir Hugh Rose was laying siege to the formidable fortress of Jhansi, although his force was only 4,500 strong (less than half the number of defenders). Plans to storm the city were postponed when a relief army under Tantia Topi appeared. Rose gave battle near the River Betwa. This river forms the boundary between neighbouring provinces of Uttar Pradesh & Madhya Pradesh. Splitting his forces ,Rose turned to face Tantia Topi’s 20,000 whilst still maintaining a bombardment of the Jhansi fortress. Rose lined up his force of around 1,500, with his infantry in the centre, cavalry on one wing , horse artillery and the 14th Light Dragoons on the other. When Rose’s cavalry charged, they received a volley from hundreds of matchlockmen but were in amongst them before they could reload. On the other wing it was a similar tale as the Dragoons charged home under covering fire from Lightfoot’s artillery battery. As Tantia Topi’s flanks retired ,the centre also broke as Rose’s infanty advanced. Returning to Jhansi, Rose had the bombardment intensified. Breaches in the walls and supposed treachery from within led to the successful storming of the city. Fatehpur (Futtehpore) 12th July 1857. Havelock’s force marched towards Cawnpore in July 1857. It comprised 1,000 Europeans from 4 different regiments (include. Madras Fusiliers, 64th R of F, and Highlanders);130 of Brazier’s Sikhs troop of 18 volunteer cavalry plus battery of 6 guns. Mutineer Regts. included: men from 2nd Cavalry, 6th and 56th Native Inf. Havelock’s main casualties (12) were as a result of sunstroke. By now Sikhs have been left behind at Fatehpur. Aong village had entrenchments in front on either flank were some walled gardens with many trees. Pandi Nudi (Pando Nuddee) 15th July 1857. The river a few miles beyond Aong was much swollen by the July rains. Crossed by one bridge, scouts told Havelock that it was about to be blown. It was a two hour march to this bridge, under a hot sun. Under the command of Bala Rao (brother of Nana Sahib) the mutineers occupied trenches on the far side of the river. Heavy guns played on the bridge. British guns, under Maude, made use of a loop in the river to pour shot into the mutineers flank. The Fusiliers under Major Stephenson swept across the bridge. The rest followed routing the mutineers. Siege of Arrah. 25 July to 3 August. A railway official (Vicars Boyle) and 14 other Europeans/Eurasians together with 50 Sikhs were besieged in a prepared guest house. Bricked-up windows and a supply of food helped the besieged. Under the house a shaft was sunk to a depth of 18 feet which provided water as well as earth for repairing defences. The mutineers and badmashes dug up 2 cannon from an arms cache, but had virtually no ammunition. The mutineers used casters from the piano and chairs from Boyle’s own main house as cannister. Garden walls and trees gave cover to attackers. They even tried to smoke defenders out by using chillies on a fire. A relief force under Eyre finally arrived with 150 men of the 5th Fusiliers, 14 mounted volunteers, and 34 artillerymen with 3 guns, drawn by bullocks. Met by mutineers that tried to outflank them, the artillery and Enfield rifles out-ranged their old “Brown Bess” muskets. Listed here are books that are generally still available, even if only secondhand. 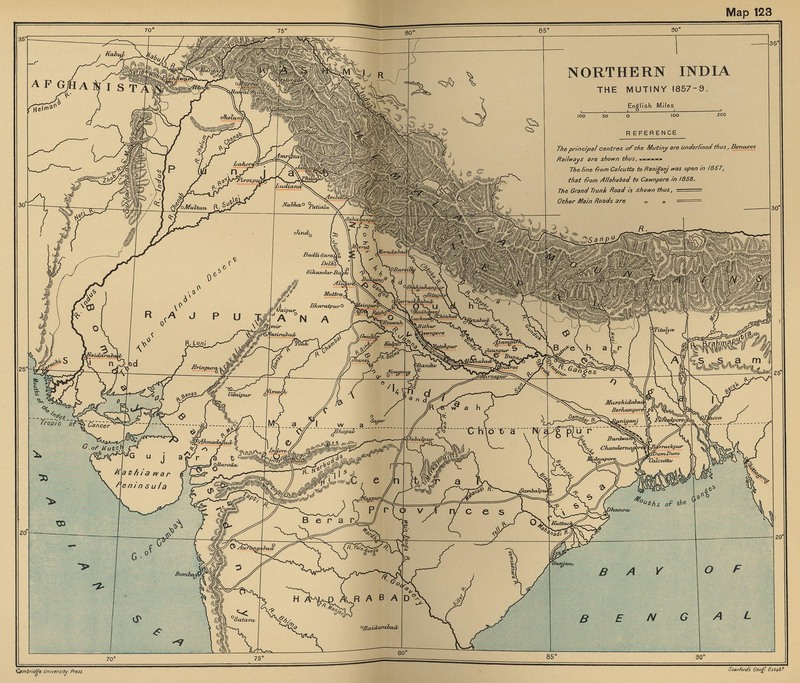 M.Barthorp, The British Troops in the Indian Mutiny 1857-59, (Osprey MAA.1994)..
D.Bloomfield, ed., Lahore to Lucknow: The Indian Mutiny Journal of Arthur Moffat Lang, (Leo Cooper. 1992). M.Edwardes, Red Year, (Hamish Hamilton.1973). J.Harris, The Indian Mutiny, (Granada Publishing.1973). C.Hibbert, The Great Mutiny 1857, (Allen Lane 1978) also Penguin paperback. Maj.D.Jackson, India’s Army, (Sampson Low, Marston & Co. London.1940). Since reprinted ? A.Llewellyn, The Siege of Delhi, (Macdonald & James.London 1977). J.C.Pollock, Way to Glory–Life of Havelock of Lucknow, (John Murray.London 1957). Sita Ram, From Sepoy to Subedar, (Routledge & Keegan Paul.1970). P.V.Tahmankar, The Ranee of Jhansi, (MacGibbon & Key. London 1958). L.Trotter, Capt., The Life of John Nicholson, (Thomas Nelson. London 1897) An older volume but still to be found. Includes section on Afghanistan. C.Wilkinson-Latham, The Indian Mutiny, (Osprey MAA. 1977). Michael Barthorp, The British Army On Campaign, 1816-1902 (3): 1856-1881, Osprey MAA 198, 1988. Maj. Gen. Gurcharn Singh Sandhu, PVSM (Retd), The Indian Cavalry: History Of The Indian Armoured Corps Till 1940, Vision Books, Delhi, 1981. T. A. Heathcote, The Indian Army: The Garrison Of British Imperial India, 1822-1922, Hippocrene Books, Inc., New York 1974. Boris Mollo, The Indian Army, Blandford Press, Dorset, 1981. J.W.Kaye, History of the Sepoy War, (3 volume history, London. 1876). G.B.Malleson’s History of the Indian Mutiny, (3 volumes, 1878-80)Close this window to return to the Table Of Contents.